Ticket Summit 2017 got underway at The Venetian in Las Vegas with a Tuesday evening reception that saw friends, clients, and competitors come together for some casual conversation before the meat of the annual ticketing convention begins Wednesday morning. The event, which is in its 11th year, is expected to draw close to 800 guests, which would shatter the 2016 record of 750 participants. Experts from a wide array of industry disciplines are presenting in workshops and keynotes, and 32 companies will be sharing their latest innovations in the Trade Show Hall. 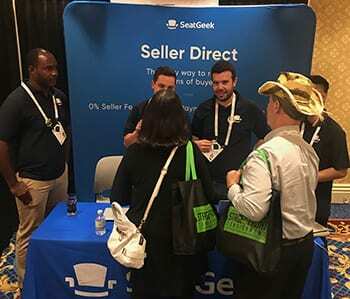 Attendees visit the SeatGeek booth Thursday night. With many of those 800 expected guests making their way to the Trade Show Hall for Tuesday’s reception, the atmosphere was that of a happy hour, with attendees swooping in on one of the venue’s bars for a refreshment and then circulating the room to meet old friends and get a first look at some new technology. They also got a swag bag at entry with some lovely tchochkes from event sponsors, including a quite nice hot/cool beverage container from DTI Management and a well made small notebook bearing Kount’s logo. Naturally, a number of conversations sprouted in the areas surrounding the refreshment spots. But exhibitors were ready and able to discuss their newest big ideas throughout the hall. From one end of the room to the other, company reps were doing the appropriate level of what one might generally call ‘shaking hands and kissing babies’ – catching up with longtime clients in what is on of the few opportunities that people involved in the secondary ticketing market get to see each other in the flesh. New innovations were discussed and demonstrated, and old relationships rekindled, with the promise for much more of that over the coming two days. “This is our seventh time at Ticket Summit, so we don’t see it as a place to get new clients anymore, but it’s a great chance to see our existing clients and also take a look at our competition and see what they’re doing too,” said 1Ticket Founder and CEO Jason Knieriem, who is also presenting in one of Thursday’s seminars. Wednesday sees the first full day of activity at the conference, headlined by the day’s keynote on The Ticketing Industry. The panel will feature key leaders in the industry, including Michael Katz of StubHub, Larry Plawsky of Ticketmaster Resale, Russ D’Souza of SeatGeek, Curtis Cheng of DTI Management, and Don Vaccaro of TicketNetwork. The new Workshops for Entrepreneurs series also kick off on Wednesday, with Insurance Matters for Small Business Owners, Mergers and Acquisitions for Ticket Brokers, How to Understand Financial Statements and Improve Profitability, and Legal Concerns for Ticket Brokers on the schedule.